The Academy was founded by Plato in 387 B.C. It’s doubtful that any of his students ever got up on a rostrum and began a speech by saying “I wish to thank the Academy…” But times do change. Now there is an Academy of Motion Picture Arts and Sciences and yesterday was their 84th Oscar awards. 82 year-old Christopher Plummer looked at his Oscar last night and said, “You are only two years older darling. Where have you been all my life?” Billy Crystal hosted and praised the Academy’s wooden president Tom Sherak saying “thank you Tom for whipping the crowd into a frenzy.” His other great line was “Harry Potter made $7.7 billion dollars, but only paid 14% income tax.” And there was the Cirque du Soleil, an imagined clip from a first focus group for the Wizard of Oz with Eugene Levy intoning, “I didn’t particularly care for the Rainbow song,” plus a revamping of the final moving scene from The Descendants where instead of kissing his dying wife, George Clooney kisses Billy Crystal. 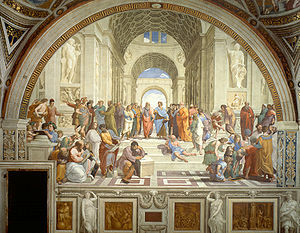 Comparing Plato’s Academy with the Academy of Motion Picture Arts and Sciences, one would have to say that that the dialogues between varying presenters like Cameron Diaz and Jennifer Lopez lacked the substance of Plato’s Ion where Socrates debates the question of whether it’s craft or inspiration that accounts for the power of the rhapsode. Actually I though Crystal's best line was after that segment where all the actors are doing these over the top self-rationalization clips about how deep and important their profession is and it cuts to him looking blankly at the camera and he just deadpans "I never felt like that."